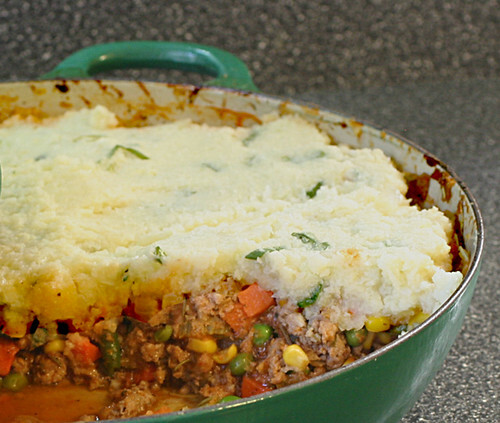 Shepherd’s pie has never been on the radar throughout my life, so I wasn’t biased when I saw a recipe for it in Clean Eating. It sounded like a good, hearty week-night meal that we could eat plenty of, feel satiated and not guilty about a bunch of added calories. Patty says: I don’t know why we never had this more often during our years on the farm. It’s one of THE BEST ways to use hamburger. On second thought, I do know why I never made it. I was always racing to get dinner on the table by 6pm. I never allowed enough time. Shepherd’s Pie had to bake that long. I missed out on many wonderful recipes on account of my pre dinner rush! Incidently, I still allow just half an hour to get dinner on the table. The difference is that now I frequently do the prep work in advance. Who says you can’t teach an old dog new tricks? After making this a few times, I thought I’d check the ‘interwebs’ for the real deal to see what, if anything, I was missing. Turns out it’s a lot of creamy, cheesy goodness. From the get-go what I’m trying to say is, if Shepherd’s Pie has been a staple in your life this recipe may very well not be for you. If, on the other hand, you are looking for something warm, comforting and filling, without all the extra fat and calories, on these extremely cold winter days, by all means, DIG IN! Patty didn’t miss out on any of the original goodness. She said: Last week, The Girls, Lou and Tracey, brought me over a big dish of their Shepherd’s Pie. It was DELICIOUS!! They said it started out as meatloaf, but wouldn’t stick together so they put in a casserole and made Shepherd’s Pie. They used instant potatoes mixed with chicken broth, creamed corn and peas. I wouldn’t have guessed it was instant potatoes if they hadn’t told me. The Girl’s are such great cooks. They improvise with just the right touch. Everything they make is superb! 10 ounces Frozen Mixed Veggies or Peas. Transfer ingredients to a 9×13 pan spread evenly and top with the cauliflower mixture spreading smoothly across the top. Bake at 350 for 30 minutes or until top is lightly browned. Wow!! This is a whole new twist on the Shepherd’s Pie!! It looks the same, but what a switch of ingredients. It sure is healthy!! This will be much better for Fred and I on our constant diets! I made a similar version of this “clean” shepard’s pie last week. My daughter had issued me a challenge to go gluten free, along with sugar, starches etc. Kind of a Primal diet. The pie turned out good. I did a mash of turnip, cauliflower and parsnips for my topping. Pretty tasty. I get clean eating magazine but thought this recipe would be a bit too clean without the cream and cheese – glad you liked it! I was going to try the bellow recipe but I think I will try yours instead.